The following section was put together to answer questions on Steve's painting technique and method. Photographs were taken at a number of steps throughout the painting of "Friday Night At Alhambra." Click on the Start button to learn about Steve's technique. Hi. My name is Steve Scheuring. This section of the website called "Steve's Technique" was put together to answer questions that I received on my painting technique and method. This section highlights a painting that I did called "Friday Night at Alhambra." I'm a boxing fan and this painting was done of the new Alhambra fight club right outside of center city Philadelphia. The photographs of these paintings were taken at a number of steps throughout the completion of this painting. I start off all paintings with a rough planning sketch completed in my sketchbook. The amount of detail in the sketch depends on the detail and feel of the painting and the amount of preplanning. For this piece, there's a lot of detail and reference photos, so I used this sketch to block out interesting reference photos and key elements. You'll notice in the finished work that the vibe and broad composition of the painting is similar to the initial sketch, but much of the detail and figure position was changed. Although I have done some plein air pieces, I use photo references for most work. This painting used over 20 reference photos. For "Friday Night At Alhambra," the general layout of the piece was clear in my mind, so I just used a very rough drawing on the canvas to get the general proportions. Used either pencil or grapevine charcoal for the initial sketch on canvas. The key focal points of the painting and the set up of the boxing ring needed to be balanced, but much of the crowd detail was worked out later. Getting the rough proportions is critical in the success of the finished piece, so I try to live with the rough pencil sketch a few days to ensure I'm happy with it. Then, I try to block out as much of the painting as possible using a thin turpentine wash with colors in the neighborhood of ones I want in the finished piece. Getting the exact values and tones at this stage isn't critical. I just need a foundation for the subsequent layers. And, the base provides some means of comparison - is this value too hot or cold? Does it need to be darker or lighter? After letting the underwash dry for a few days, it was time to start working in the detail. For this piece, I knew the viewer's eye would naturally go to the boxing ring. It's the center of the piece. The vanishing point in the single-point perspective is in the center of the ring. And, the reason to go to the event is to watch the fighting. But, what inspired me for this piece was the crowd - it's fun to people watch at the fights. The fights attract all types - you can spend 6 hours at the fights just watching the crowd - not watching the fights at all - and still have a good time. At Alhambra, many of the seats are "standing room only," so attendees have a unique opportunity to mix and mingle with lots of different people. Wanted to catch that vibe in this painting, so I planned heavy use of high light and dark value contrast, multiple light sources, and close contrasting colors (colors opposite on the color wheel, like blue and orange, next to each other) to create a sense of movement. Started to work on the foreground crowd since I wanted this to be a "distraction" from the boxing. Also knew I needed time to observe the main characters' personalities develop - painting them early helps me have a clear eye toward changes that need to be made later. Some of the main characters begin to take shape. The figure at the extreme left in profile is my buddy Bob. In many of my paintings, you'll notice something in the extreme foreground. In "The Road Kings," it's a set of handle bars. In "Les Deux Magots" and "Wonderland," it's my wife Stacey. I like to use that harsh contrast of something in the immediate foreground to help pull the viewer into the painting and make them feel part of the action. 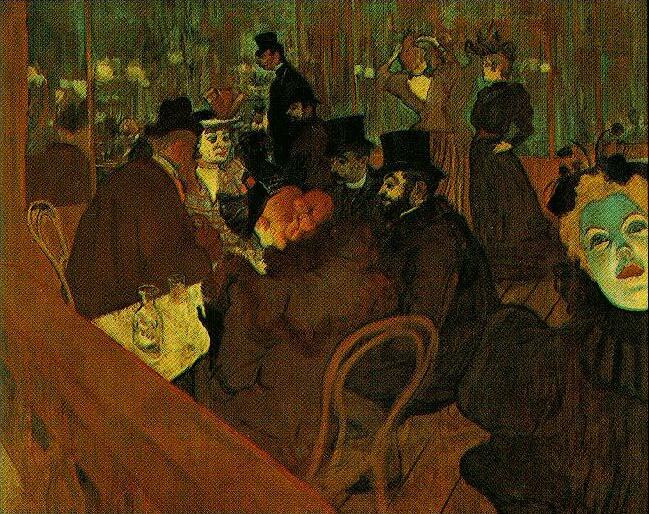 Have seen this technique in a number of other artists' work but was particularly inspired by Henri de Toulouse-Lautrec (check out the blue-faced lady in "At The Moulin Rouge") and David Hockney. In one of Hockney's collages, he assembled a number of photos of Billy Wilder smoking a cigar ("Billy Wilder Lighting his Cigar," 1982). In the extreme foreground is a full wine glass - makes you feel like you're sitting there in the bar sharing a drink with the guy. In another Hockney collage, his friends are playing Scrabble ("The Scrabble Game," 1983). A Scrabble letter holder is in the extreme foreground, again, making the viewer feel like they're part of the action. Try to replicate this same technique in my work. I purposefully painted Bob with little detail and loose strokes. Wanted the viewer to feel like he's there with you, but didn't want him to be a focal point. Using him in profile also directs the viewer's eye toward the center of the painting. In this step, I started to flesh out the seated crowd. Particularly like bandana guy and red flannel shirt guy. Was also drawn to the white-hat guy in the foreground, middle right - cool hat. Wanted the viewer to feel like they knew these guys without seeing their faces (or, very little of their faces). The guy with the big-gun arms and slicked-back hair in the left foreground is a fixture at the fights - never met him, don't know anything about him, but I feel like I do. Also adjusted Bob's eye - thought it was riding a little high, so brought it down and opened it a bit. Some more of the crowd takes shape. Some more characters develop. Worked on the attractive female (right side) walking up the aisle. At this point, I'm comfortable with the crowd except for one - the guy wearing the white shirt right in front of the female - you'll see what I do with him later. Now, I started to flesh out the crowd on the right side of the ring. Liked the older guy in the white shirt with his hands in a boxing defensive position explaining to his buddy how to box. You see a lot of that at the fights - guys throwing imaginary punches as they tell their stories. In this step, I began to strengthen the background. Used a mix of van dyke brown, cobalt blue, and cadmium red light. I don't mix the paint too thoroughly on the palette preferring to mix on the canvas - gives a variation to solid blocks of color. I also never use black - even in the darkest darks - I mix other colors to get close. Just a personal preference. Think it's really hard to see a true, deep black - a total lack of light - in nature (unless you have your eyes closed) - "everything's shades of gray." Also think black is a crutch - keeping black off my palette forces me to truly see the various colors in the reference material. Now, I began to flesh out some of the detail on the left side. Put in the boxing posters (Had fun doing that part. Love the old, rough looking posters. And, like the idea of doing a "painting in a painting" - think that's one reason I'm attracted to carousels and giant swing rides - fascinated by the artwork on those rides), general color in the flags, and base color for the ring posts. Some other areas take shape. Started to work on the balcony. Also began to focus the main figure in the right foreground - started to intensify the darks in his coat and shadows on his face. This guy's my dad. Wanted the detail and contrasts to be heightened in this area because I wanted the viewer to feel like they're talking to him. Going to the fights with my dad is special. Can remember watching Ali/Frazier and other classic fights with him. Now my father starts to take shape. Concentrated on the position of key facial features. Also started to lay in the highlights on the leather coat. Wanted this to have both the darkest darks and lightest lights so the figure would jump out at the viewer. Also fleshed out the detail in the balcony. The figure just to the right of my father (next to the right ear) is my friend Prentis. He and I have been going to the fights on and off since '96 - brought him to the Blue Horizon, a legendary boxing venue in Phili, one time and he was hooked. Next to him are his friends Erik and the hulking figure is Vidal. Yep, Vidal is that big. Also in this step I changed out the figure in front of the lady walking up the aisle on the right hand side. Changed him out for another figure of a guy with a handlebar mustache. Continued to develop background detail and ghosted in the boxers and referee. Again, if the proportions are off, the painting is off, so just wanted to develop the frame of the fighters so I could live with the image for a while. Also adjusted the foreground security guard. Began to lay in more figures on the left side background - check out the security guard in the yellow shirt. Now, I adjusted some of the background colors - muting them with complimentary colors so the background would recede. Also began to flesh out the detail in the ceiling. Although this area isn't a focal point in the painting, I wanted to create subtle variety in the color and tones to give the impression of volume. Wanted a strong foreground and background in the ceiling. Also began to flesh out the pillars on both the left and right sides - important elements to the painting because they act to break the painting into thirds. The boxers, referee, and ring details are blocked in. More of the ceiling detail (to the left and right) is laid in. Also blocked in the overhead lights. Want these lights to be real intense, so I needed to create a base to build up the paint. At this step, I also added the yellow, red, and blue lights used at the boxing ring to make sure the boxers retain their color on TV. Think this minor detail gives the painting a sense of balance and order within the chaos. Also think this detail highlights the key colors used throughout this painting. It's like the spice or ingredient a chef uses throughout a number of dishes to tie them together. The reds, blues, and yellows are used to create a balance throughout the work. The blue of my dad's shirt, the blue in the background flag banners, the blue in the balcony, ring posts, and large screen. The red in the guy's shirt on the left side. Red in the ring posts. Red in the hand wheel and posters near the balcony. Yellow in the security guard shirts on the left and right side crowds. This repetition of color helps balance out and create order to the chaotic scene. Details around the ring are worked on. Highlights are laid in on my father, and other details are worked on. Some colors are adjusted - for example, the red brick wall on the left is darkened and muted with complimentary colors so it doesn't appear so bright and hot. I soften the border around the lights using a dry brush when the paint is almost dry. Then, the lights are strengthened and other close details, like the ring ropes, are added. Then, I sign the painting to finish it. Hope you enjoy "Friday Night At Alhambra" as much as I enjoyed creating it. Look for "Friday Night At Alhambra" on Steve's Artwork Giclées page.